It is a small hardy, barely 2 1/2 inches across. Quite lovely, well formed, with a lot of petals. Now for the downside, it is pink. So many pink varieties, there is hardly a reason for one more. So as far as the market goes, this may not be terribly special. Since there are enough similar plants, this may not present enough special quality to be introduced. For my own yard, it is however quite a treasure. I am calling it ‘Kirk’s Gift’ after my father. I have a few other really nice hybrids, but none of my hybrids could really be put in the league with my father’s. I do have a mini yellow that is a cross between Helvola and Mexicana, that will occasionally bloom in full shade and blooms quite well in partial shade. I was experimenting with Helvola because it is a great mini, has odd blooming times and seems to like shade. However Helvola is quite picky about water depth and in the Texas heat, it does not always thrive. This nice yellow mini does have enough good qualities to make it special, except, I am scared to let anyone else have any ‘Mini Mexi’, since it will take over and eliminate Mexicana from a pond. To put that in perspective, Mexicana is legendary amongst pond gardeners for taking over ponds. Mini Mexi grows much, much faster than Mexicana does. This might make it useful for creating biomass, but in the wild, it would spread way to quickly. This makes this lovely plant, potentially pond kudzu. Still, by using it to breed with other waterlilies, I may yet get a plant that would not shame the family name. Well Done Bob! My compliments! I think your Dad would be proud of your pink. Sooo, pond kudzu huh? If I put regular mexicana in a pond with odorata – will it drive the white out???? Odorata, has it’s own reputation for invasiveness. 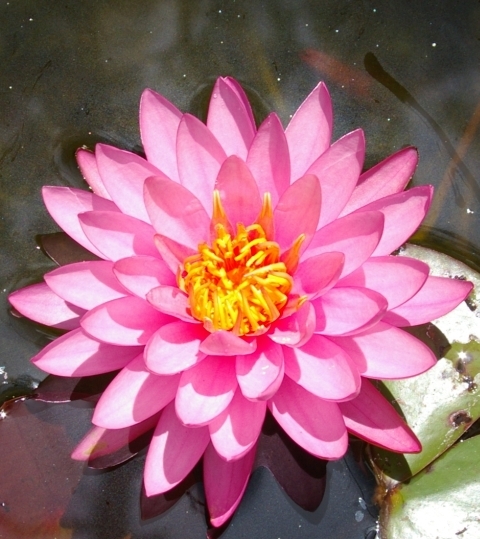 The term ‘odorata root’ is often used to imply, ‘it will take over the pond,’ by water gardeners. In a shallow pond however, my money would be on the mexicana over the long run. 😉 If the pond dries out regularly, then the mexicana will win hands down. Interesting! I have seen whites at 11′ deep in Lake Raven at Huntsville, but I have never been able to plant them deeper than 4′. I have always suspected that it took them decades to move out that deep from the shoreline. So – I could plant whites at 4′ and yellows at 3′; and they would go up and down the slopes… It would be interesting indeed to see where-what elevation they balance out! Question: do grass carp eat water lilies?? They seem to be concentrating on grasses in my project and leaving floating seedbox alone – altho I know that they will eat them when all else is gone. I can just see mexicana fighting them tooth’n’nail for survival…. Grass carp love waterlilies! Ages ago, from a research project done in Arkansas, I tasted some delicious grass carp that had been raised on lawn clippings. They were delicious, but I have never before or since, experienced so much difficulty with bones. At the time some folk were considering that these could be the answer to a lot of the worlds food problems. Then again they could be a true ecological horror. I have seen grass carp used to clean up mexicana, one of the best ways to do it. I have also seen beavers clean out all the waterlilies in an area. They like to roll up the leaves and eat them like a burrito.